I made a bunch of new recipes this week thanks to a little Blackberry app I downloaded (for free!). 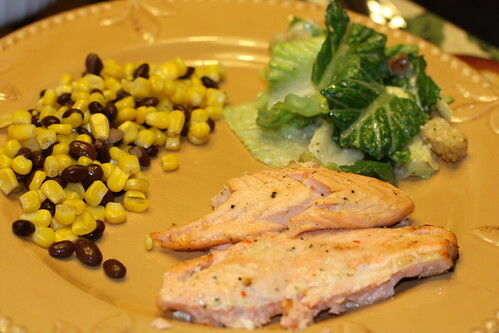 I'm posting the Broiled Caesar Salmon, some info about the neat things the app will do, and then I'm giving away grocery money - yeah! Mix lemon juice, oil, wine, and salad dressing until well blended. Here's the thing, we went to two different grocery stores and couldn't find caesar dressing mix. So I used Good Seasons Italian Dressing mix instead. But I would love to try the caesar, so I'll keep a look out for Kroger to carry it. Reserve 1/4 C of the dressing mixture. Pour remaining dressing mix over the salmon and cover. Refrigerate for at least 30 minutes. Drain, and discard the dressing mixture. Set oven to "Broil" and move an oven rack to the highest slot. 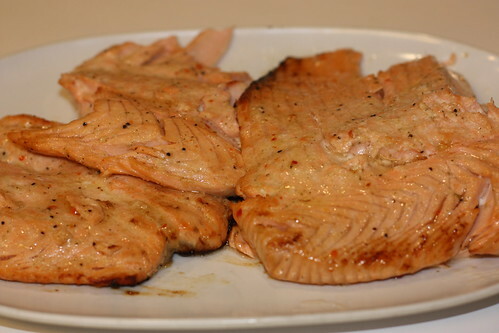 Place salmon on greased rack of broiler pan. Broil 2 to 4 inches from heat for about 6 minutes on each side, or until salmon flakes easily with a fork, brushing frequently with reserved dressing mixture. Served with a caesar salad and black beans and corn. Everyone loved it! The Kraft iFoodLite Blackberry app (also for iPhones) has 7,000 recipes - with pictures! It has easy search and browse, and a Recipe Box where you can save the ones you like and easily pull them up later. You can save the ingredients of any recipe to the Shopping List, which you can then pull up by "recipe" or by "aisle." You can see the star rating, the comments, and the nutrition information on each recipe as well. It will come in handy for those moments when you are standing in the grocery store and have no idea what you're doing. Not that I would know about that. I made the salmon above, Parmesean Chicken, Banana Pudding Squares, and a really good Three Cheese Chicken Pasta. I was given grocery money for taking the app out for a spin, and I have some for you too! Two commenters will receive $50 American Express gift cards! Two winners! For one entry, visit the Kraft iFood web site and tell me which feature would be most helpful to you. Tweet or Facebook this giveaway for a second entry (please leave me a second comment with url link). Giveaway ends at midnight central time on Jan 28, 2010. Visit Rachel for more yummy recipes! I'd love the mobile recipe box feature. Very cool! I hate it when you torment me like this. I like the recipes. I am always finding an ingredient at the store that I want to buy, then getting it home, and trying to find a good recipe to make with it. With the mobile app I could do it while at the store and not have to deal with not having one of the ingredients! Been a silent stalker of your blog for a while- nothing like a give a way to drag me out! Since my phone is just, well, a phone, I can't imagine all the wonderful stuff they offer to iphone people. But the mobile recipe box sounds really nice! Since I've just moved, the store locator would actually be really helpful! Unfortunately I don't have an Iphone...but my hubby does have an iPod touch. Amy, I'm so glad you posted this. I bought salmon last night to eat this week. I was going to have to search out a recipe but now I don't have to! I grill the salmon in the dark in a driving rain last week. I do not want an encore performance. Thanks for the recipe! Shannon - I love that too. If you have some ingredient at home that you don't know what to do with (how does that happen anyway?) you can enter it and recipes will pop up! Mynde and vandy Wife - I don't have an iPhone either, but they've adapted the app for Blackberry users we well. I would love the mobile recipe thing, that way you wouldn't have to keep writing the lists out to go to the store! $50 in grocery money would be awesome right now. I've been on FMLA for 12 weeks, with no income! I use the iPhone app all the time. I tend to use the "dinner tonight" feature when I'm wandering in circles in the grocery. I love Salmon! I cook it with lots of fattening things like butter, mayonnaise, and such. I love the budget section because I've got to feed a teen on a budget! I really need an iphone. That app looks great. The recipe box- cause I am SO bad about losing recipes that turn out great! I'd use that mobile recipe box and the listing of recipes. Unfortunately, I have device to use the app. It would be really nice to have all my favorite recipes in one easy to access spot. Hate to beat a dead horse, but the mobile recipe box is a great idea...can't wait to check out the app! I'd like an app for the Android so I could use it on my phone. Recipe box would be great. I"m going to comment because I have a Blackberry and had no idea this app existed. You ROCK! I wish I liked salmon...but I just don't. I do however like technology. I'll have to see if the app works with my HTC phone. I love that you can search for a recipe based on an ingredient...I'm always feeling like I'm in the mood for something with....egg noodles and I've got nothing as far as ideas...now I will! MOBILE RECIPE BOX!!!!! going to download asap on Blackberry!!! easy to look up a recipe to share with friends! The grocery list feature for sure! I'm all about the smart shopping list and store locator. That's awesome!